Slurred speech. Long pauses. Answering questions that weren’t directed to him and blurting out others. For days, Japan’s Finance Minister Shoichi Nakagawa’s appearance, during which he appears to be drunk, has been painfully public on the YouTube video of a G7 press conference in Rome last week. Today, it finally cost him his job. At a press conference in Tokyo, he resigned from his cabinet post, delivering yet another blow to the administration of Prime Minister Taro Aso as he struggles to keep control of his party and deal with the country’s ever-worsening economic crisis. 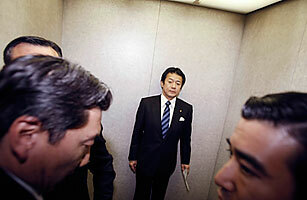 Aso has already named Minister of the Economy Kaoru Yosano, 70, as Nakagawa’s replacement. Yosano, who claims he taught DPJ leader Ichiro Ozawa to play the chess-like game of Go, will now wear three hats in Aso’s government, running the ministries of economy and finance and the Financial Services Agency, which oversees banking. A fiscal conservative, Yosano was runner-up to Aso in the LDP elections last September. If things get much worse for the Prime Minister, there is even talk that Yosano could become the new head of the party and lead it into upcoming general elections. How well this bodes for the struggling LDP remains to be seen; the last time that Yosano and Ozawa played Go, Ozawa won. See pictures of Denver, Beer Country. See TIME’s Pictures of the Week.